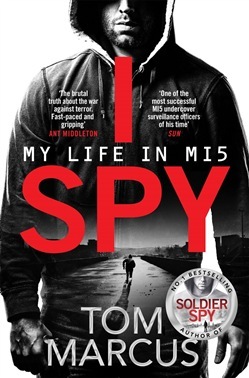 'One of the most successful MI5 undercover surveillance officers of his time.' - Sun 'The brutal truth about the war against terror. Fast-paced and gripping.' - Ant Middleton The explosive new book from ex-MI5 surveillance officer Tom Marcus takes the reader on a non-stop, adrenalin-fuelled ride as he hunts down those who would do our country harm. Tom spent years working covertly to stop those who want to do us harm. In his bestselling memoir Soldier Spy, he told how he was recruited and described some of his top-secret operations. In his new book, he takes us deeper undercover as he puts his life on the line once more. I Spy plunges the reader straight into the action as Tom and his team race to prevent terrorists from causing carnage on our streets and outsmart Russian agents, blocking a daring plot that threatens the security of the nation. Relying on their quick wits, training and courage, the extraordinary men and women of MI5 are under intense pressure every day. Not everyone is suited for the work, and Tom shows how the incredibly tough challenges he faced growing up gave him the mental strength and skills to survive in a dangerous world. Gritty and eye-opening, this is a unique insight into a hidden war and the sacrifices made by those who fight it. You will never take your safety for granted again. Acquista I Spy in Epub: dopo aver letto l’ebook I Spy di Tom Marcus ti invitiamo a lasciarci una Recensione qui sotto: sarà utile agli utenti che non abbiano ancora letto questo libro e che vogliano avere delle opinioni altrui. L’opinione su di un libro è molto soggettiva e per questo leggere eventuali recensioni negative non ci dovrà frenare dall’acquisto, anzi dovrà spingerci ad acquistare il libro in fretta per poter dire la nostra ed eventualmente smentire quanto commentato da altri, contribuendo ad arricchire più possibile i commenti e dare sempre più spunti di confronto al pubblico online.